There are times around here when I forget that Big Sister E is only 3 (there are other times when it is abundantly clear that she is 3... but that's a different story). She helps me with housework, runs and gets things from other rooms and is especially good at excitedly telling me when Little Sister B is doing something that she shouldn't. "She's on THE CHAIR, Mama!" or "She's pulling THE BOOKS DOWN!" don't worry me all that much, but the "Mama, she's got ____ in her MOUTH!" are the ones that make me pay close attention. Unfortunately for Big Sister E, that means that there are a set of toys and activities that she enjoys that we can't do until her little sister takes a nap and we don't have to worry about what she might try to ingest. 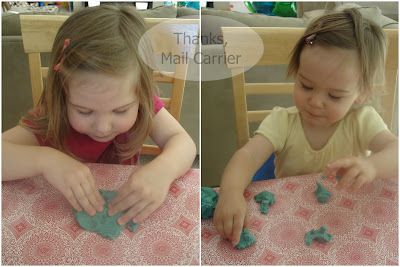 Until recently, one of those included the big bin of play dough and the fun of rolling, shaping and creating with it. Have you seen the ingredients in that stuff? All kinds of weird preservatives, chemicals, lubricants, hardeners... plenty that is not going in my daughter's mouth if I can prevent it. So, imagine both girls' surprise and excitement when I told them that we were going to get out a play dough that was safe and fun at the same time. One glimpse at the colorful box of Yummy Dough and it was as if life for them had just gotten so many times better than before. Following the directions, we started off by washing both our hands and the table to be sure that our Yummy Dough would stay nice and clean. I became slightly concerned at the next step when I read that we needed to mix exactly 20 ml of water with the powdered dough mix. How much was that? Fortunately, I just hadn't taken everything out of the Yummy Dough box and found a plastic syringe waiting for just that purpose. 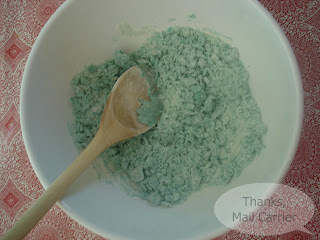 As soon as the drops of water hit the white powder, they turned bright and colorful, which amazed Big Sister E. After I had added precisely 20 ml, I mixed with a spoon to get a crumbly dough. Pulling the crumbles out of the bowl, I began to knead them together to form a smooth, pliable dough. Handing each one a chunk of Yummy Dough, I told Big Sister E and Little Sister B to play with it. Make something! Be creative! At first, they both obliged. While Big Sister E chatted about the dog and its bowl and its bone and everything else that her dough was turning into, Little Sister B did exactly what I knew she would do and took a taste. Discovering that it wasn't bad, convincing her to play with her dough was somewhat of a lost cause from then on, although I did get her to roll and pat it a few more times. Big Sister E had a great time though and the two of us managed to put together a tray of things out of the red and blue Yummy Dough that I had mixed. I even tried combining a small chunk of each of them together and found that the resulting purple was a really pretty color. Had we mixed up the yellow and the green as well, I would have liked to try a multitude of combinations to make a whole rainbow. Even though the instructions said to use baking paper, I lined our cookie sheet with aluminum foil and found it worked just fine as well. After baking at 270° for around 15 minutes (I checked on them a few times because some of our handiwork was much thinner and smaller than others), everyone was ready for a taste. No, our Yummy Dough creations weren't quite as perfect as the examples, but Big Sister E could still tell you the story behind each one. As for the flavor, we were all pleasantly surprised with how good this is both raw and after being cooked. I felt like we were sampling slightly less-sugary tasting sugar cookies and both Big Sister E and Little Sister B were only too happy to gobble up any pre- or post-baked treats. 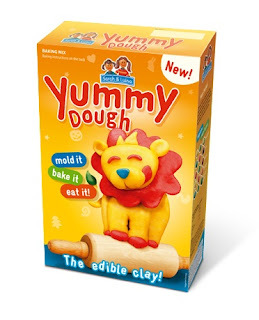 The only downside to Yummy Dough that I can think of is that once you use it, it's gone! It can't be stored without having been baked, so this isn't a product that you could put in a container and pull out another day. However, once your kids have taken a bite of it, there probably wouldn't be any leftovers to stash away anyway. 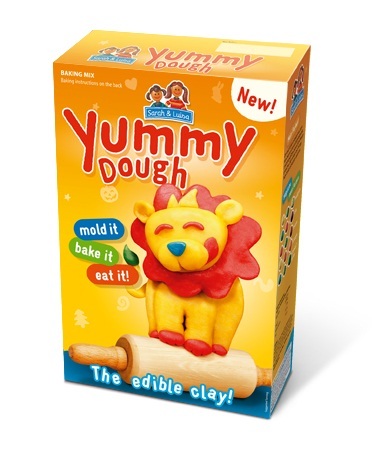 One lucky person will win a box of Yummy Dough containing everything they need to make red, blue, yellow and green tasty dough! To enter to win: Visit Yummy Dough and tell me something that you learned or found interesting there. 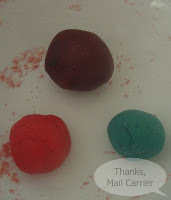 3 Extra Entries if you blog about this giveaway linking back to Thanks, Mail Carrier and Yummy Dough. Please leave an address where it can be found. Giveaway will end on June 24th at 11:59pm CST. Do me the favor of leaving an email address or making absolutely sure it is visible in your profile, I have to have a way to contact the winner. The winner will be chosen by random.org and announced here as well as emailed and will have 48 hours to contact me or respond to notification or a new winner will be chosen. This giveaway is open to residents of the U.S. and Canada only. 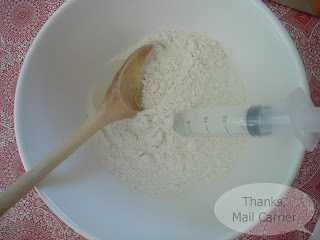 A giant thank you to PlaSmart for providing Yummy Dough for me to review as well as for one lucky giveaway winner. The opinions shared are my own and honest and if you really need to see more, click here to see how I roll. I learned that the ingredients for the European version and the ingredients for the USA/Canada versions are different. Think I prefer the USA/Canada ingredients! I learned that You can eat it raw or after it is baked. the product was created for children by children! The dough can get eaten raw or baked. The recommended age for the dough is older than 3 though. Entered the DownEast Basics giveaway. You can make the numbers for a birthday cake with this dough. I learned that they have tutorials and patterns on the site for making cool shapes. I love the Tips and Ideas section...the idea for making numbers for a cake is so cool! I learned that you can make super-cute birthday cake decorations with Yummy Dough! I entered the DownEast Basics swim giveaway. I learned that you can make Crispy Candies made of Yummy Dough! Everything goes into their mouths so its a great idea!! I've never heard of this - it looks so neat! I looked at the Yummy Dough site and love how they even give you step-by-step directions on how to make things such as Captain Cookie, lol!! I follow your blog in Google! Yummy dough is incredible. I think I;ll have to try it for our preschool! great idea/article about using yummy dough to learn abcs! I found instructions to make little candies with the dough. Cool! I Like Yummy Dough on FB. What a clever idea a dough that you can bake and eat. Teaches kids to shape dough. I found it interesting how to create the Captain Cookie...CUTE! I learned some great ways to use edible dough... such as table decoration, etc. I love that the colors are so vibrant. I learned that it was created for children by children!! I learned they have many patterns available for download.